You write, you discover a shared connection, you email a few times - perhaps even text or chat on-line: time for a phone call, right? Yes…under normal circumstances. Alas, these aren’t always normal circumstances. For many transgender women, her phone voice is her weakest female link. 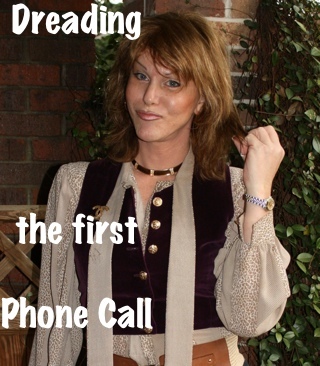 Even full-time, transsexual women with successful careers as women still get “sired” on the phone now & then…including me! Imagine your overweight and the very first time you’re going to meet someone you special is on a beach. Not an ideal spot for the first date, huh? Most of us want to meet new potential partners in a situation that puts our best foot forward. For many transsexual women our voice is our weakest link trait and the one thing we’re most conscious about. Thus, when you request to “go voice” you should know that our hesitation might not be rooted in a desire to go slower. Because of this, lots of transgender women go out of their way to not connect on the phone before a face-to-face meeting…insisting on constant email contact. Granted, such caginess could be an indicator of a flake. However, it’s often rooted in her awareness that our voices are often our weakest link in terms of “passing”. If you speak with her on the phone without seeing her female self – it might cause you to draw back a bit. Let her know you’re aware she might not be 100% comfortable with her feminine voice if she draws back a bit after you request to go phone. If she still won’t take or return your call? Move on…she’s probably got more issues going on than you need in your life.